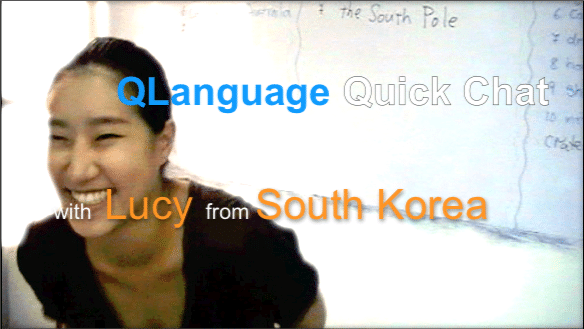 New to our YouTube channel this week is a Q Language Quick Chat video featuring the charming Lucy from South Korea. At the time of this informal interview, Lucy had been studying English at Q Language for approximately five months. You’re Korean! Why Come To Hong Kong To Study English? Lucy came to Hong Kong because of its proximity to her home country and because she sees Hong Kong as such an international city. She was originally studying Chinese in Hong Kong at university but decided she needed to brush up her English language skills as her Chinese lessons were being taught in English and she was finding it quite challenging to keep up. She plans to take another Chinese course in the future when her English has improved sufficiently. Lucy said that she really enjoys being at Q Language because she has met a lot of different people from around the world and and that it was really exciting to study with classmates from such a wide variety of backgrounds and cultures. She also mentioned that she likes her English teachers very much and that her English has improved a lot since studying at Q Language. I’ve improved a lot since I came here. Yeah, I think I’m getting better and better. Lucy went on to study ay Q Language on a full-time basis for over a year and the teachers were very impressed with her dedication to language learning. Thanks once again, Lucy, for agreeing to do this short interview and thanks too for being such a great student to have at Q Language. Lucy: I’m Lucy, I’m from Korea, or South Korea. Interviewer: South Korea, OK! And are you a student here or are you a teacher here? Lucy: I’m a student here. Interviewer: Oh you’re a student, I thought you were a teacher. And how long have you been here? Lucy: I’ve been here for 5 months, about, yeah, 5 months. Interviewer: And why in particular did you come to Hong Kong to study English? Lucy: First of all, Hong Kong is a very international city in Asia and very close to Korea as well and I used to study Mandarin in Hong Kong at the beginning and then I just switched it to study English now because I thought English is (the) most important thing if I live in Hong Kong. Interviewer: And did you study Mandarin and English at Q Language? Lucy: No, I used to study (at) university; the language centre in Hong Kong. Interviewer: Right, and what made you come to Q Language then? Why Q Language? Lucy: Yeah, when I was learning Mandarin they used English, they (were) teaching in English, though most of the time I couldn’t understand, that’s why I thought, ah, first of all I have to learn English perfectly and then take the Chinese course again. Interviewer: And what do you like about actually being in Q Language. Lucy: Mmmm, it’s very, yeah, like international too just like, there are lots of classmates from other countries, so I can meet many different people, different classmates so it’s very exciting! Yeah, it’s interesting, many of the countries, I’ve never been there but when we (get to) know each other, I know something different (about their) culture, yeah, and different personalities. Interviewer: And what about the teachers here? Who’s your teacher here? Interviewer: Do you have just the one teacher of different teachers? Lucy: Different teachers. One teacher is British but he was born in (I think) Macau and he is a Hong Kong resident. Interviewer: And the teachers are nice? Lucy: Yes, very nice. He is very active in the class. Yeah, lots of fun and another teacher, Anneka, she’s from England, yeah, a Brit. Yeah, this is (the) first time (we’ve been) studying together so I don’t really know about her, but she’s very nice too. Interviewer: And do you feel like your English has improved? Lucy: Yep, I’ve improved a lot since I came here. Yeah, I think I’m getting better and better. Interviewer: Better and better! And is it lots of kind of conversation work or is it lots of grammar, or is it kind of a good mixture? Lucy: At my level they try to do more conversation but of course do, yeah, grammar as well so I think its a good mixture. Interviewer: Alright, Lucy, well it’s been lovely talking to you and I think we’ll call it a day there, OK? So thank you very much and I’ll see you again. Lucy: Your welcome, see you.